We moved into a house half the size of our last one. 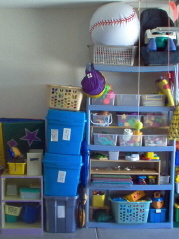 Setting up a child care was easy with plenty of storage closets and rooms dedicated to child care. 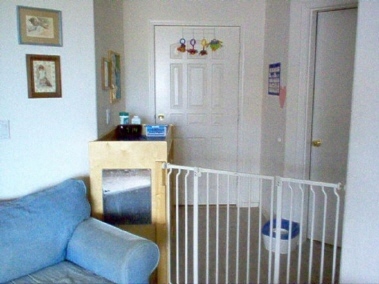 Moving into a house that has almost no closet space and condensing the child care to the living room only was quite a shock. The question has become where do you store everything? It has taken about a year to figure out a few things. 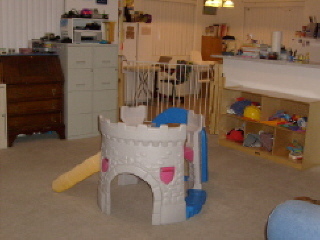 * Look for items that can fold up such as Play Hut-type toys, tunnels, etc. * Limit toys to one box each: One box of Duplos, one small box of waffle blocks, one shelf of books, etc. 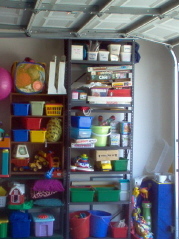 * It's okay to get rid of stuff not used right now such as a spare baby swing or toys that don't interest the kids anymore. * When I bring new toys in, it's time to get rid of old toys. Note: Slightly better photo below. 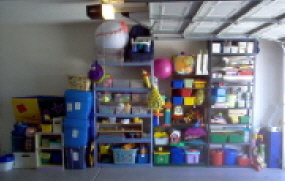 I figured out I could take a wall in our garage to dedicate to child care. I gathered storage shelving from anywhere I could find (thrift store, road side, etc.) I also gathered storage baskets and buckets. I sorted through my toy collection and pared down to one container for each type of toy (one bucket of Duplos, one basket of soft blocks, etc.) and stacked them on the shelf. 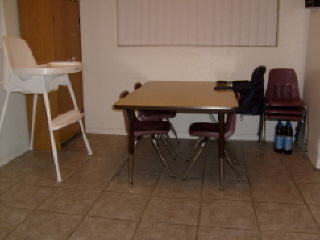 I must also use this area for bedding, mats, cots, play pens, potty chair, baby swing, etc. I really had to look at my priorities.